When legendary musicians Baba Allauddin Khan, Pandit Ravi Shankar and Mallikarjun Mansur performed, music concerts were enjoyed best in 'baithak' style—under the shade of trees, inside courtyards or parks and even on the terrace of a bungalow. These evening gatherings which included a small group of people—20 to 50 in total—was a treat to music connoisseurs. These days, however, with fancy stages, large cameras, studio lights and glorified 'concerts', baithak-style performances have become a thing of the past. Teamwork Arts will rekindle nostalgia on May 27 in Delhi where Hindustani classical vocalist Vidhi Sharma, sarangi player Ahsan Ali and Rajasthani folk artist Anwar Khan Manganiyar will share the floor and perform under the shade of banyan tree. 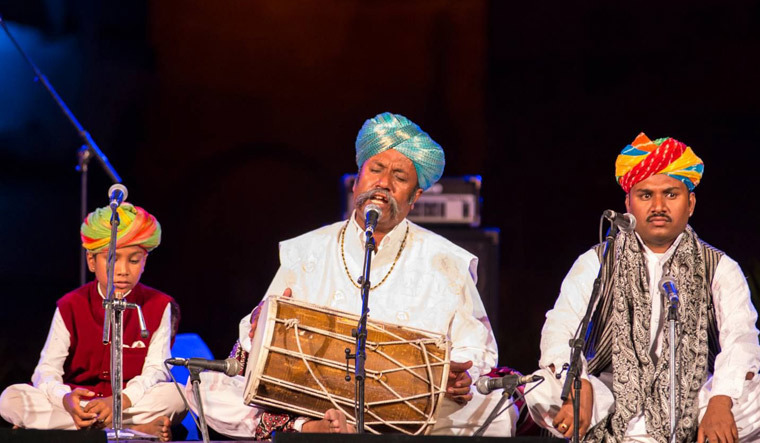 As a folk singer, Manganiyar's performance will include Hindustani classical and Rajasthani folk along with a qawwali performance. His version of Kesariya Balam will see a blend of classical and Rajasthani folk. Whereas Ali is giving his usual sarangi composition a twist and is improvising the genre with a new composition. “When Teamwork Arts approached me for this concert, I started making new compositions. I have tried to change the sound and style of sarangi and people will see blues, jazz, fusion and contemporary music in my showcase,” he says. Though the showcase includes Hindustani classical music, Ali has also decided that he will start with classical composition and will take it to blues and other genres. “I want to make people understand that sarangi is not a traditional instrument and you can also play western tunes on it. I want them to break the barriers attached to this instrument so that young generation ends up learning it instead of usual instruments such as guitar,” he says. The event will take place opposite Qutab Minar.